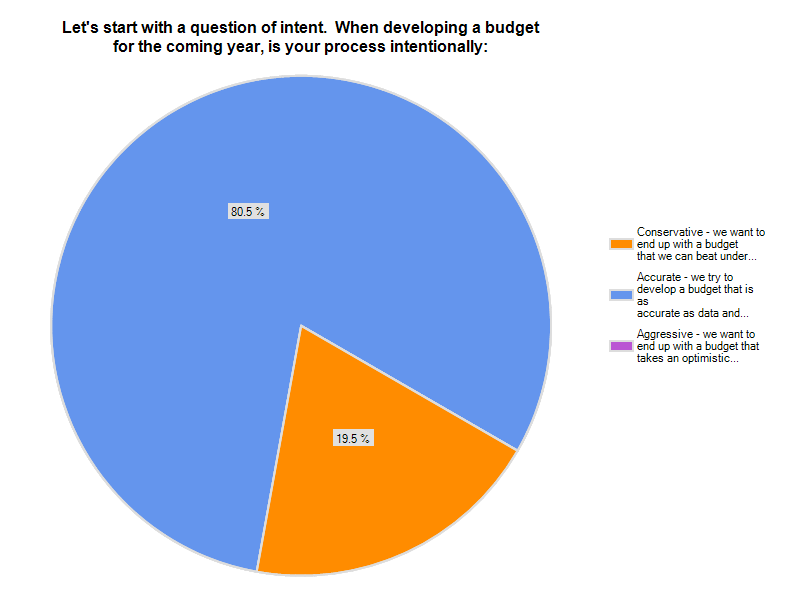 Our September Law Firm Strategy Question of the Month focused on the budget process. 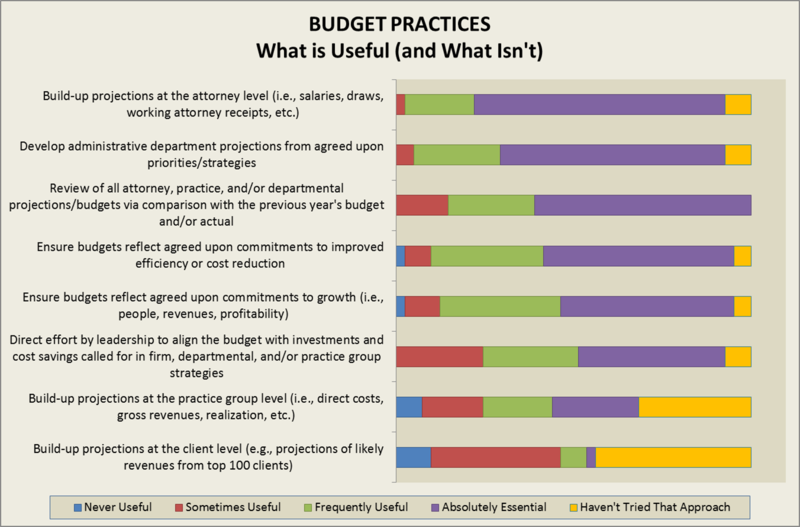 Specifically, this month’s quick survey identified the budgeting practices that are most useful in real world settings in law firms. As in past months, we also looked for differences between firms reporting the greatest effectiveness in their respective budget processes from those reporting less success. Unlike previous Strategy Questions of the Month (see for instance the June survey on strategic planning or the February survey on practice group management), there was not a tremendous difference between the most effective budget processes and others’. That may in part be a function of the generally high level of effectiveness law firm leaders reported in their respective processes. 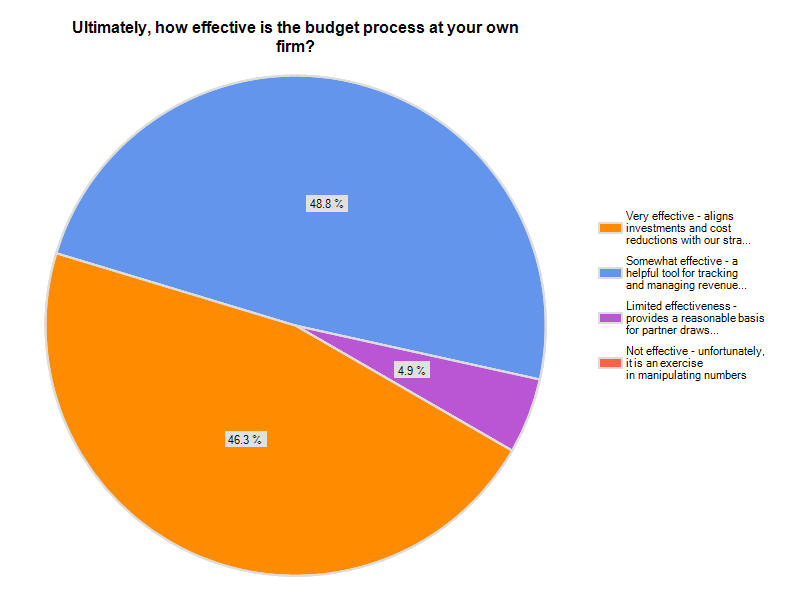 As you can see from the chart below, very few firms consider their budget process to be ineffective (or even of limited effectiveness). Finally, the most successful firms were more likely to focus leadership attention on aligning the budget with strategy (at the firm and practice group levels). Firm leaders were asked to share how they approach the process philosophically (intentionally conservative, aggressive or “as accurate as data and projections will allow”). Roughly 80% of firms are striving for accuracy (over 90% of the most successful firms’ intent is to develop as accurate a budget as possible). We view that as a positive sign for the industry as a whole. In the depths of the recession (fall of 2008 and again in 2009), a majority of firms were taking a decidedly conservative approach to budgeting. The swing toward developing accurate budget projections is a healthy sign that leadership has greater confidence in the future. Reviewing all attorney, practice and/or departmental projections via a comparison with the previous year (budget and/or actual). A relatively high percentage of firms do not even try to build-up projected revenues at the client level (e.g., projected revenues from the top 100 clients) or at the practice group level. Slightly more than half of all firms build-up client level projections and fewer than three-quarters of firms develop practice level projections. Accuracy is important to us…final result of budget is cash flow to partners (who) plan their own lives around the draws and distributions. Also, variance explanations that are based on inaccurate budgeting rather than on real differences from our expectations are viewed with suspicion. (We) do intensive capital expenditures budget, plus detailed monthly cash flow (which is NOT an income statement), plus zero-based approach to all expenses. We also do both pessimistic and optimistic models based on individual attorney performances. We update budgets every 6 month in rolling 18 month program of forecasting. Expenses are easy and we can plug them in and hit them within one percent annually. Lining up expenses with strategies and goals is simple and straight forward. Predicting revenue and cash flow is the hard part; we are usually successful in estimating and in the last couple of years have had done well with monthly cash flow projects. Nonetheless, cash receipts are always a bit lumpy and make budgeting a challenge. Formula for best shot at success — balance realization with utilization and monitor expenses closely. Be efficient and effective and take nothing for granted. Our attorneys are very reluctant to forecast much more than 3-6 months ahead, so trying to get them to project for a full year has proven impossible. We base (the year) on trends, knowledge of practices and their short range projections. (Relative to client level projections, we do a) case by case analysis of all contingent cases…review three year averages of attorney productivity…and review any large non-repeat type cases or situations. (We) have found it useful when presenting the expense budget to management to sort (accounts) in descending order on dollar value. This helps to ensure that major items are discussed, and that time isn’t wasted debating the lobby magazine subscriptions. (We use a) bottom up process. The Finance Committee and Board review budgets, ask for justifications and will require a bottom up revision to get the final budget in line with long range goals. (It is) time consuming but effective in getting buy-in at all levels. As always we thank the many, many law firm leaders who took the time to share their knowledge and insights on this month’s strategy question. The comments section is open for those who want to continue the dialog and we welcome your calls (312-543-6616) and emails (jsterling@sterlingstrat.com) as well.